Looking for a place with country music, line dancing, good people and awesome drink specials? 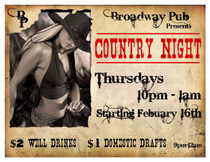 Come on out to Broadway Pub every Thursday for Country Night! 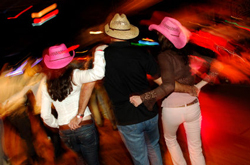 We play your favorite country music videos and the best line dancing sets to get your boots moving! Stop out Thursday Nights and see why Broadway Pub is the place to be for that down home country feel! Win a pair of tickets to see Blake Shelton perform at the Great Allentown Fair with Special Guest Sunny Sweeney! Entries for the ticket drawing are accepted at Broadway Pub in Bangor, PA every Thursday on Country Night. $5 per entry and the winner will be announced Thursday August 16th at the Broadway Pub at 11PM. Must be present night of drawing to win. Winner receives two tickets to see Blake Shelton on Wednesday August 29th at the Allentown Fairgrounds along with a Premium Paid Parking Pass. Total prize package is $150.00 value!